Any dog knows that humans have very poor senses of hearing and smelling. We don’t have a very good sense of time either. We really have no sense of our own lifespan, let alone a billion years. Our planet is thought to have condensed from a dust cloud about 4.2 billion years ago. We used to think there was about a billion years of peace on earth before life germinated, but it keeps getting pushed back to 3.6 and maybe 3.8 billion years ago. I find myself thinking that a mere half billion years from the formation of the planet to the beginning of life is surprisingly short, given how inhospitable it was back then. I am actually thinking that a half a billion years is short! 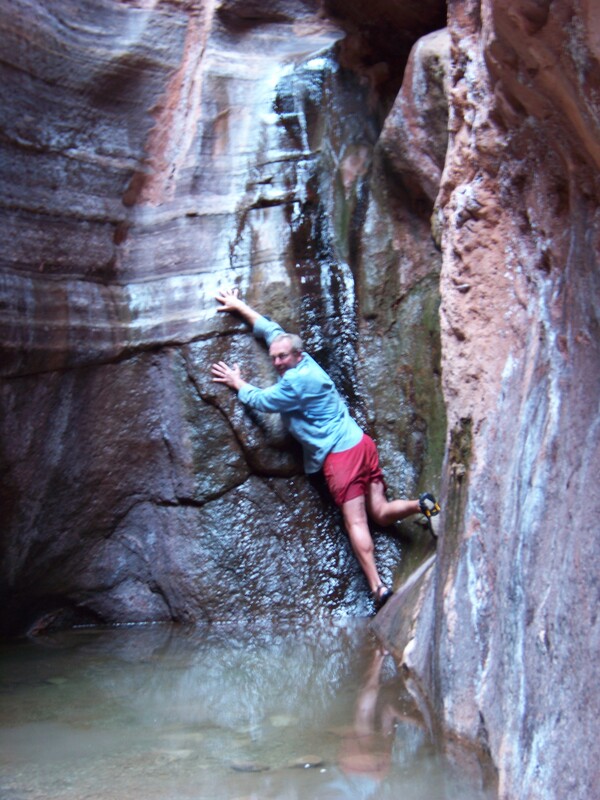 Here is a picture of a crazy guy with his arms around 1.2 billion years in the Grand Canyon. The layers of sediments are about a mile deep and they can be read like a book, but a lot of pages have been torn out here. This happens when an area is uplifted for a while and the sediments get washed off. There is just enough time in the billion years remaining for life on earth for a mountain range like the Rockies to be buried under a mile of sediments, for a river to cut down through it, and for some unimaginable creature with a better sense of time than ours to ponder it. This entry was posted in History of Life. Bookmark the permalink.